All of our furniture is crafted by skilled furniture artisans, from cutting the timber for your sofa frames, and sewing the fabric to upholster your pieces. Can you help me design my sofa? We love designing furniture and would be happy to help you find and design the right piece for your home. Our interior design team can help you with fabric colours and styles which will suit your space. What happens if I don’t like my creation? We know you are going to love your furniture. If for any reason you don’t like your item, you are welcome to return it. Furniture & Me ships custom made furniture all around the world. Could you help deliver the lounge into my house? Shipping is free curbside delivery only and you must be present to accept the delivery. Extra charges apply if you require further assistance. Please contact us on +61 2 9557 0226 or email us if you would like to arrange this. 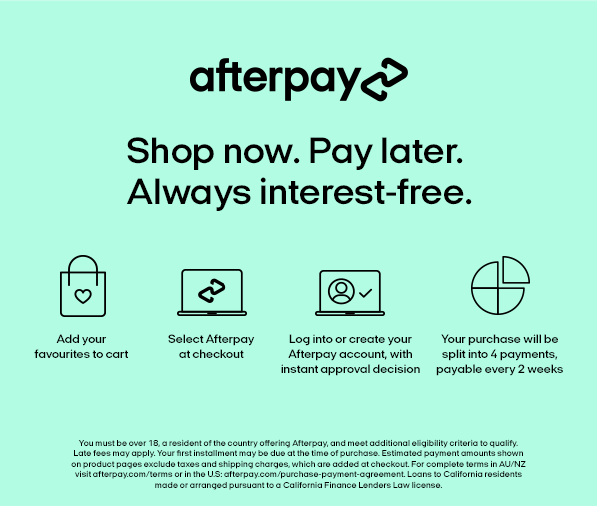 Afterpay is a way to order your product without needing to pay the whole amount upfront. We ship your order out as normal once it has been manufactured and you pay it off fortnightly over 8 weeks. No! There is no extra cost, interest fees, or added fees to use this service. The only time you will need to pay a fee is if you miss a payment. Please see the Afterpay Terms & Conditions for further information about late fees. Split Payments is an exclusive Furniture & Me opportunity that allows you to split your payment over time. This means you have a longer period of time to pay off your purchase with smaller repayments! How does Split Payments work? Split Payments works by splitting your purchase in half and allowing you to pay it off over time. You will complete one Afterpay transaction of 4 repayments over 8 weeks and pay the remaining balance through Paypal. You purchase the product, begin your Afterpay transaction, and receive the product once it has been manufactured after 8-10 weeks and you have paid the remaining balance through Paypal. Who can use Split Payments? We provide a 2 year replacement warranty on our products if your piece is damaged within that time. Please contact us on +61 2 9557 0226 or Email Us for assistance.